This controversial rule change has AQHA members up in arms on both sides of the debate. The rules changed by the Executive Committee will result in harsher penalties for individuals with animal welfare violations according to the AQHA rulebook. These violations are now expanded to include tying tails (to reduce “unhappy” tail action in the show ring) which is effective immediately; the outlawing of the use of clenbuteral as a performance enhancement in both racing and showing, effective May 1 for racing and November 1 for showing; and most controversial, the outlawing of lip chains in the halter ring, effective January 1, 2016. To better understand this issue, we’ve broken it down into the definition of the lip chain as well as outlining the arguments from both sides. What is a lip chain? Lip chains are used in many industries to help restrain and calm tense, nervous and excitable horses. One of the most televised uses might be the Kentucky Derby; one of the most common uses might be while the vet is performing a delicate procedure. I’ve used the lip chain many times personally to help restrain and soothe horses who was receiving injections. The lip chain runs from the side ring of the halter under the upper lip, snug against the gums, and then back out the opposite halter ring to the lead. The lip chain must be kept snug to work or the horses can work it into their mouths or spit it out. The lip chain when properly applied releases endorphins to keep a horse calm and focused. Like any tool, the lip chain can be easily misused and abused. Why are lip chains used in halter classes? 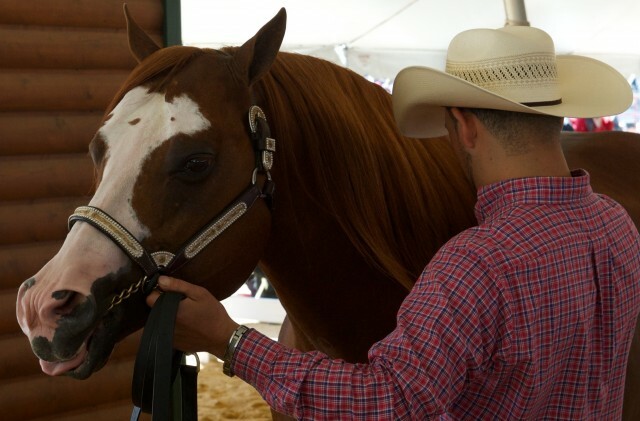 Many exhibitors, especially youth, amateur and Select (an AQHA division for amateur competitors over the age of 50) rely on the lip chain to feel confident when controlling their halter horses. While halter in theory sounds like a pretty untaxing class for the horses (they are shown in hand at the walk and the jog, presented to the judge and then stand still) the showing environment, other horses and handler’s nerves can all combine to form a reactive and potentially dangerous animal, especially among young horses and stallions. The lip chain makes many handlers feel more confident in their control over the horse. The old rules left the choice of lead up to the exhibitor, including lip chains, chin chains and plain leads. The lip chain is viewed as an inhumane tool by some when put in the context of the show ring: why should these horses need the lip chain just to show? How have we perverted the halter horse into a creature that needs to be restrained through the use of an intense chain aid, rather than the presumably good-minded citizen who can walk into the halter ring and then go ride in all of the performance classes? Many anti-lip-chain individuals argue that the lip chain never used to be a common tool in the halter class in “the old days” (presumably the golden age of AQHA showing, when the association recorded high numbers and top participation.) The modern halter horse is often fitted to show only in-hand; many are not shown in any performance classes at all. They are fed to develop muscling, which can also make them hot and hard to handle. The argument against lip chains is also striking a blow at this type of horse, which is a far cry from the all-around animal envisioned when the Association was formed. Another common theme within the anti-lip-chain camp is that horses must be better trained and better prepared at home to be able to stand up in the show ring without the use of the lip chain, and perhaps even better bred for a good, solid mind. Just as loud in their arguments are the exhibitors, trainers and professionals who are petitioning to have the lip chain rule overturned. The most common argument in support of the lip chain is that exhibitors, ring crew, judges and horses have been put in harm’s way without the safety net of the lip chain. No matter how much training is done at home, there is only so much that can be done to prepare a horse for the stresses of the show ring, and the lip chain is an important tool for keeping horses under control. There is a belief that if the hot, fit halter horses can no longer be shown because they cannot perform without the chain, then inferior horses will start winning the halter because they are better able to stand up for the class. Some fans of the halter class, which has been suffering low-and-falling numbers in recent years, believe that this is a move to do away with halter completely. A few voices are concerned that the AQHA has yielded to pressure from PETA (there is no evidence to support this claim that I’ve found) and that the door has been opened for animal rights activists to target spurs, crops, and even bits next. It’s a complicated issue to be sure. Where do you stand on the lip chain debate?